Lying just outside the national park boundaries, Mt Greenlaw is a sought-after peak, being the second highest in the area (after Mt Murchison) and has a reputation as a challenging climb. 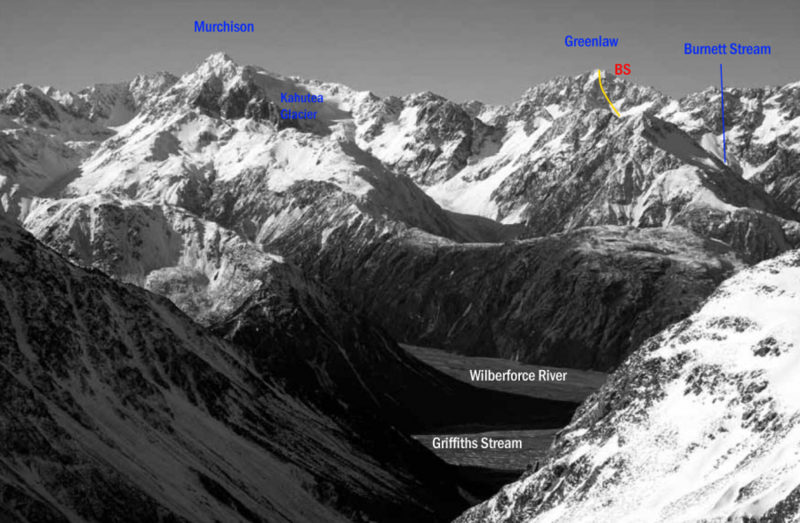 The North East Face is the standard route to the summit, whether approaching from the Waimakariri or Avoca Rivers. Mt Greenlaw is the best climb from the head of the Anti Crow River. The usual route crosses Gizeh Col and descends to the upper Avoca Valley, then ascends the bluffs to the Avoca Glacier and the North East Face route. A longer, more varied route crosses Fools Col to Avoca Col, then follows a broken ridge to Greenlaw Col. From the col, either continue along the North Ridge, or traverse the snowfield and climb the North East Face. Gain the Avoca Glacier as for the North East Face route. The north ridge can be reached from the glacier at various points and followed to the summit, but this is a loose, jagged and time-consuming option. From Moraine Flat, head upstream and ascend scree slopes to the base of bluffs below the Avoca Glacier. Several routes are possible through the bluffs, which involve straightforward rock climbing and scrambling on reasonably good rock. From the top of the bluffs, cross the Avoca Glacier, heading south-west towards the summit of Mt Greenlaw, avoiding gendarmes and loose rock on the north ridge. The rock on the summit of Mt Greenlaw is notoriously loose. At the end of the glacier, rather than join the north ridge, traverse south slightly on to marginally better rock on a rib that leads directly to the summit. Follow this to the top. The east ridge can be gained at about half height from the Avoca Glacier. Straightforward mixed climbing from the Avoca Valley.